The Friends broke ground on the new Back Patio project. Phase I is underway, the initial hardscape is being installed, this includes demolition of existing exterior, installation of drainage, and decking. Plants, final irrigation, mulch, tables, benches, chairs, umbrellas (shade) will be added as funds allow. Don't miss the opportunity to leave an indelible mark at the Library! Sponsor one of the Commemorative Planks today - during the construction phase you can purchase a Plank for $150. This limited time offer ends September 5 when the sponsorship price increases to $250. For details and to order your plank visit our fundraising page and complete the order form. 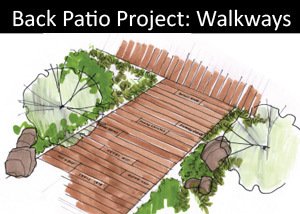 View the concept drawings for the patio, and see photos of the patio construction on the 'The Library' page. Scotts Valley Friends find Facebook!! pARTy in the Library - tickets on sale!